There was a thought that germinated very early on in human history. People observed the world and understood that much of existence was beyond their control. And so the conclusion was simple: There must be forces, or gods, out there that manipulate the factors in our world. And because life depended on these factors — like rain and sunshine — the job of humans was to placate these gods so that they provided favorable elements. So people would offer sacrifices and perform rituals to keep these gods happy. It’s an idea that seems very archaic to us now. But it also makes the scene in Genesis 15 very powerful to me. Here we find Abram dealing with an entirely different kind of God. 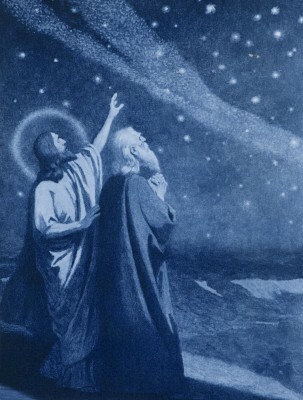 This God, Yahweh, is making some outlandish promises to Abram: not only a son (his wife was having trouble conceiving), but descendants that will number the stars and a new beautiful land for them to live in. Which doesn’t seem like much, but it went against everything people assumed about gods in that day. That’s why when Abram chose to believe that this God was different, Yahweh credited it as righteous faith. Our world has moved on from some of these basic ideas about the way the world works. Our knowledge about the environment has given us a much better perspective on how things work. And yet a seed of these early thoughts hang around in our consciousness. We can still approach God through a very similar lens. God is good and we are bad. Our job is to get in his good graces by jumping through his hoops. If we can do that well enough, perhaps we will be blessed or receive salvation. We look at Scripture and see an instruction manual full of rules that must be followed in order to please a powerful God. We read and find guidelines — conditions for our relationship with him. But this understanding of God is really not that different from those very early ideas of detached and demanding gods. In Exodus 20, the Israelites were at the foot of Mt. Sinai. They had just come from the slavery of Egypt and walked on dry ground through a parted sea. This God was obviously powerful. And now they waited at the base of the mountain for instructions. You were slaves, but now you are free. You were property, but now you are family. You were always asked to give, but now I will provide. Before he gave them some guidelines, this God wanted to set them straight: You are already mine. The commandments he gave them were not a condition of their relationship, but a confirmation of it. That’s why the Israelites spoke of God’s law — Torah — in such reverent terms. They did not just see rules to follow; they saw a better way to live in the world. They treated it with joy and not distain. Instead of restriction, they saw freedom. Because they saw a God who provided when all other gods demanded. It was a radical idea for Abram to believe back in Genesis 15. It was a radical concept for the Israelites in Exodus 20. And it’s a radical idea to believe today. God is not demanding that you follow his rules. He’s trying to give you a better life. So today may we believe the same progressive idea that Abram believed all those years ago. May we understand that Yahweh is a God that provides. May we see his guidelines for life as confirmation of relationship, not conditions. And may we find freedom instead of slavery. Because our God is undemanding. This entry was posted in Ordinary Days and tagged Belief, Good life, Joy, relationship, Rules. Bookmark the permalink.